Fourpure Limited was founded in 2013 by Dan and Tom Lowe, two brothers with a passion for beer and travel. The brewery remains a family run business and the team strongly believe in working with great ingredients to brew their beer. In fact, the four key ingredients used to make beer – grain, yeast, hops, and water – are what inspired the name ‘Fourpure’. Fourpure has recently expanded the brewery, including installation of a 40HL brewhouse at a project cost of around £2.5m, enabling it to keep up with the growing demand and rapid development that the business is experiencing. By expanding into a fifth warehouse, covering a total of 20,000 square feet, Fourpure has completed a growth phase seeing improvements to their now state-of-the-art brewing, packaging and distribution facilities. The addition will allow them to increase production capability by 400% to 14 million pints per year. To support this crucial expansion, Close Brothers Brewery Rentals was able to provide a Hire Purchase facility to fund the new Brewhouse. 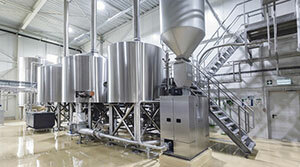 In-depth understanding of the industry and the equipment required enabled Fourpure and Close Brothers to arrange this complex deal in a time frame to suit the brewery. The equipment, which includes a GEA new 40HL Brewhouse, complete with fermentation vessels, carbonator, centrifuge, CIP and other associated equipment, was installed and commissioned in the last few months of 2017. The future is looking very bright for Fourpure, and Close Brothers Brewery Rentals looks forward to continuing to support this innovative and growing business. This entry was posted in News and tagged Beverages. Bookmark the permalink.